J Cancer Metastasis Treat 2018;4:31.10.20517/2394-4722.2017.77© The Author(s) 2018. Department of Gastroenterological Surgery, Kumamoto University, Graduate School of Medical Sciences, Kumamoto 860-8556, Japan. Gastric cancer (GC) remains one of the most common cancers and serious health problems worldwide. For unresectable or metastatic advanced gastric cancer, chemotherapy treatment is first selected. Although chemotherapy has improved survival in patients with advanced gastric cancer (AGC), the prognosis of these patients remains poor. In recent years, some therapies targeting biological molecules have been reported to prolong the survival of patients with AGC. Since trastuzumab, a monoclonal antibody that targets HER2, was established as standard therapy for unresectable GC in a HER2-positive patient, many other targets have been reported as new therapy targets. Many molecular targeted therapies, such as HER2, VEGFR or EGFR, have been verified as established standard treatments with or without chemotherapy in clinical trials. Furthermore, immunotherapy is expected to be an effective treatment with promising clinical trial data. Especially, immune checkpoint inhibiters, such as PD-1/PD-L1 or CTLA-4, have demonstrated innovative progression in GC therapy. Moreover, ongoing clinical trials including targeted therapy and immunotherapy have shown promising results in improving clinical outcomes, safety, and tolerability. In this article, we review targeting therapies and immunotherapies for GC and summarize future prospective treatments. Gastric cancer (GC) is one of the most common cancers and the third-leading cause of cancer-associated deaths worldwide, especially in East Asia. Almost one million new cases (952,000 cases in 2012) have been estimated to occur annually. In early GC, radical surgery with or without perioperative chemotherapy is the most recommended curative choice. For unresectable or metastatic advanced gastric cancer (AGC), chemotherapy treatment is first selected. Conventionally, cytotoxic agents, such as 5-fluorouracil (5-FU), platinum agent, irinotecan, taxanes, and anthracyclines, are used for AGC. Among these, recommended as the first-linetreatment, is a combination of 5-FU and platinum-based chemotherapy with or without docetaxel. This treatment results in a median overall survival (OS) of 10-15 months and a median progression-free survival (PFS) of 5-6 months. For second-line treatment or after treatment, docetaxel, irinotecan, and paclitaxel are known to improve prognosis compared with best supportive care (BSC). Although chemotherapy has improved survival in patients with AGC, the prognosis of these patients remains poor. However, some therapies targeting biological molecules have been reported to prolong the OS of patients with AGC. Trastuzumab, a monoclonal antibody for human epidermal growth factor receptor2 (HER2), has already been established with chemotherapy as first-line treatment for HER2-positive AGC patients. In addition, ramucirumab, an anti-vascular endothelial growth factor receptor 2 (VEGFR2) antibody has also proven to be efficient for second-line treatment[5,6]. Therefore, this targeted therapy field is indeed currently evolving. Recently, immunotherapy has also been expected to be an innovative therapy for several types of cancer. Cancer immunotherapy can reverse tumor immune escape associated with suppression of the immune checkpoint pathway. Immunotherapies targeting programmed death 1 (PD-1)/programmed death-ligand 1 (PD-L1) checkpoints have been identified to be an important scientific breakthrough and have already been approved in treatment of many types of cancer including melanoma, non-small cell lung cancer (NSCLC) and renal cell carcinoma. In addition, immunotherapy has begun to be approved for last-line treatment in GC patients based on the latest clinical trial data. Immunotherapy has important clinical application with favorable outcomes, limitations, and acceptable adverse events, with it having been applied in many past and undergoing clinical trials. In this article, the latest knowledge of focused on common cancer targets, signaling pathways, targeting therapies, and immunotherapies for AGC are reviewed and future prospects for AGC treatment are described. Since trastuzumab, a monoclonal antibody that targets HER2, was established as standard therapy for unresectable GC in a HER2-positive patient, many other targets have been reported as new therapytargets. Furthermore, phase III trials that target HER2, epidermal growth factor receptor (EGFR), vascular endothelial growth factor (VEGF)/vascular endothelial growth factor receptor (VEGFR), MET, or the mechanistic target of rapamycin (mTOR) have been examined with new findings [Figure 1 and Table 1]. We introduce the current knowledge of targeting therapies for GC. HER2 is a proto-oncogene encoded by ErbB2 on chromosome 17. Trastuzumab was the first HER2-targeted drug to be developed and introduced for the treatment of HER2-positive metastatic breast cancer. Trastuzumab induces antibody-dependent cytotoxicity which causes the downregulation of cell cycle disorders. The ToGA trial, comprising randomized controlled trials recruiting patients with histology confirmed, inoperable, locally advanced, recurrent, or metastatic adenocarcinoma, was the first randomized phase III trial to show trastuzumab plus chemotherapy. The result of this trial with trastuzumab plus chemotherapy is superior to chemotherapy alone for HER2-positive advanced or metastatic gastric cancer with regard to OS and DFS. Furthermore, up to 22.1% of patients were HER2-positive [Immunohistochemistry (IHC)2+/ fluorescence in situ hybridization (FISH)+ or IHC3+] in this trial and especially, the OS of the HER2 high-expression group was 16.0 months. This result precisely demonstrated the efficiency of trastuzumab for AGC. One novel antibody drug targeting HER2, trastuzumab-emtansine (TDM-1), was confirmed to be significantly effective in breast cancer. However, a phase III study for HER2- positive GC patients added with TDM-1 could not prolong OS and PFS during second-line treatment (GATSBY study). The reasons for this include the heterogeneity of HER2 expression in GC or the changed pattern of HER2 expression by first-line chemotherapy. The detailed analyses of those results are yet to be revealed. Lapatinib, which is bound to the intracellular tyrosine kinase domains of epidermal growth factor receptor (ErbB1) and HER2 (ErbB2), blocks autophosphorylation and downstream signaling. In a phase III trial, for first-line treatment aimed at patients with HER2-positive GC, lapatinib with capecitabine + oxaliplatin (CapeOx) showed no significant difference in OS compared with placebo + CapeOx (LOGiC study). In the lapatinib arm, toxicities were increased, especially diarrhea. The effect of lapatinibis was reportedly also dependent on region and age. Although the efficiency of lapatinib plus paclitaxel has also been evaluated in second-line treatment for a phase III trial, no increase in OS and PFS was observed (TyTAN trial). However, in patients with HER2-positive tumors or in China, clinical benefits have been shown. Therefore, the correlations in each condition need to be examined. Epidermal growth factor (EGF) is a protein that promotes cell proliferation, growth and differentiation by binding to EGFR. Furthermore, EGFR is a transmembrane protein that activates by binding of ligands, including transforming growth factor α (TGFα) and ErbB. EGFR has been identified as an anticancer therapeutic target and many drugs that inhibit these bindings have been developed, including cetuximab, panitumumab, and nimotuzumab. Cetuximab is an IgG1 monoclonal antibody that inhibits ligand binding to the EGFR and stimulates cell-mediated cytotoxicity. Addition of cetuximab to conventional chemotherapy has already been established as one of the first-line chemotherapy regimens in many types of cancer including patients with KRAS wild-type metastatic colorectal cancer (CRC)[14,15]. In a phase III trial of GC, addition of cetuximab to capecitabine + cisplatin did not improve OS and PFS (EXPAND study). These results were generally consistent between subgroups. Therefore, the critical factor of a negative result was unclear. In CRC, KRAS mutations are negative predictive biomarkers of cetuximab efficiency. However, KRAS mutations appear at low frequency in GC. Thus, this study could not have detected KRAS mutations as a predictive biomarker in GC patients. Other trials in advanced NSCLC have reported EGFR expression levels as a predictive biomarker of OS in patients treated with cetuximab. Searching the characteristics of molecular or patient groups is required for effective treatment with cetuximab. Panitumumab is a recombinant, fully human, IgG2-monoclonal antibody that is highly selective for EGFR. Panitumumab in combination with chemotherapy has been established as the first-line and second-line treatment of KRAS wild-type metastatic colorectal cancer. In a phase III trial of esophagogastric adenocarcinoma, addition of panitumumab to epirubicin + oxaliplatin + capecitabine (EOC), in interim analysis, median OS in patients allocated modified-dose EOC + panitumumab was inferior to that of patients allocated EOC and could not be recommended for use in populations with advanced esophagogastric adenocarcinoma (REAL3 study). Some factors associated with poor outcomes have been discussed. For one, combinations of EOC with full-dose panitumumab during the initial stages of the trial were associated with unacceptably high rates of grade 3 diarrhea. Therefore, oxaliplatin and capecitabine doses had to be reduced in this study. Another factor is that negative interaction might have occurred between panitumumab and EOC components or it may have been necessary to select patients by molecular characteristics. Therefore, identifying a subpopulation of patients benefiting from panitumumab or more details verifying the mechanism of molecular signaling is required. Nimotuzumab is a recombinant humanized monoclonal immunoglobulin G1 antibody that acts against human EGFR and blocks the binding of EGF and transforming growth factor-α to EGFR[19,20]. This mechanism inhibits cancer-cell proliferation, angiogenesis, and induces apoptosis. Although a phase II trial, as second-line therapy, nimotuzumab plus irinotecan vs. irinotecan alone to AGC was performed, with no superiority of nimotuzumab plus irinotecan over irinotecan was alone observed. However, nimotuzumab plus irinotecan showed that potential improvement in a subgroup of patients with EGFR high expression subgroup was based on improved PFS, OS, and response rate. Therefore, in second-line treatment, a phase III study aimed at comparing the efficacy of nimotuzumab and irinotecan combination therapy on irinotecan alone in patients with EGFR overexpressed advanced GC or gastro-esophageal junction adenocarcinoma (GEJA) is ongoing (ENRICH study, NCT01813253). The results will be reported in 2017, with some efficiency expected. VEGF is a signal protein produced by cells that stimulate the formation of blood vessels and mediate tumor angiogenesis. Bevacizumab is a humanized monoclonal antibody that blocks angiogenesis by inhibiting VEGF-A, which stimulates angiogenesis in many types of cancer and was the first available angiogenesis inhibitor. In a phase III trial, adding bevacizumab to capecitabine-cisplatin in first-line treatment of AGC did not increase OS compared with capecitabine-cisplatin (AVAGAST trial). However, adding bevacizumab to chemotherapy significantly increased PFS and overall response rate (ORR). Especially, in the European and Pan-American regions, the clinical benefit of the addition of bevacizumab increased the most. The necessity to search a biomarker to detect patient groups who have responded to bevacizumab treatment in this trial has been discussed. Ramucirumab is directed against the VEGFR2 that mediated the majority of downstream effects of VEGF in angiogenesis by binding to VEGFR2 as a receptor antagonist blocking VEGF/VEGFR2. In a phase III study of AGC, ramucirumab monotherapy increased median survival time (MST) compared with placebo (REGARD study). Furthermore, in another phase III study of AGC, the combination of ramucirumab with paclitaxel significantly increased both OS and PFS compared with placebo with paclitaxel (RAINBOW study). Therefore, ramucirumab was established as one standard therapy for unresectable GC. The REGARD trial and RAINBOW trial both demonstrated the role of VEGFR-2 as an important therapeutic target in AGC. In the AVAGAST study, the efficiency of bevacizumab for Asian patients tended to be insufficient. In addition, second and further lines of therapy are more commonly received in Asia. In the REGARD trial, the control arm was designed in BSC. Therefore, other factors might experience difficulty in influencing the results. In the latest ongoing phase III study, the combination of ramucirumab with capecitabine and cisplatin is compared in PFS to capecitabine and cisplatin as first-line therapy in metastatic GC or GEJA (RAINFALL trial, NCT02314117). Apatinib (also known as YN968D1) is a small-molecule tyrosine kinase inhibitor (TKI) that highly selectively binds to and strongly inhibits VEGFR2 and decreases the VEGF-mediated endothelial cell migration, proliferation, and tumor microvascular density. This agent also inhibit c-kit and c-SRC tyrosine kinases mildly. In a phase III trial, apatinib treatment significantly improved OS and PFS in patients who had at least two lines of prior chemotherapy fail compared with BSC. Therefore, apatinib is focused on as a novel type of targeted treatment for AGC in several lines of therapy. Regorafenib is an oral multikinase inhibitor, targeted angiogenic (VEGFR1, VEGFR2, and TIE2), stromal and oncogenic receptor tyrosine kinases. In a phase II trial, regorafenib significantly increased PFS compared with placebo as second-line or later-line therapy in AGC (INTEGRATE trial). Preliminary biomarker analysis from this trial suggested that the benefit of regorafenib was comparable in patients with VEGFA levels above and below the median. Especially, multitargeted tyrosine kinase inhibitors and similar have been required to define the subset of patients who could influence the clinical benefits. At the present time, a phase III trial is planned. c-MET is a transmembrane tyrosine kinase receptor for hepatocyte growth factor (HGF). c-MET activation promotes cell growth, invasion, and HGF/c-MET activation that occurs in several types of cancer including GC. Furthermore, HGF/c-MET pathway has been related to tumor formation and metastasis. Rilotumumab is a fully human IgG2 monoclonal antibody that acts against HGF that blocks the binding of HGF to its receptor and inhibits HGF/c-MET-mediated response. A phase III study (RILOMET-1) compared epirubicin + cisplatin + capecitabine (ECX) with or without rilotumumab in untreated patients with unresectable/advanced GC or GEJA who were c-MET positive and HER2 negative according to stained immunohistochemistry. The study was prematurely ended because of an imbalance of deaths and OS, PFS, ORR were worse in the rilotumumab arm. Simultaneously, another phase III study (RILOMET-2) that compared capecitabine and cisplatin (XP) with or without rilotumumab was ceased for the same reason. Considering these results, the influence of the aggression of cancer was mentioned. To clarify the cause of these results, clinical and biological analysis of the association between c-MET and GC is required. Onartuzumab is a monovalent antibody that acts against c-MET and binds to the extracellular domain of c-MET preventing the ligand HGF. A phase III trial compared mFOLFOX6 with or without onartuzumab in MET-positive and HER2-negative gastroesophageal adenocarcinoma (GEC) (METGastric trial). However, addition of onartuzumab to first-line mFOLFOX6 did not significantly improve clinical benefits in OS, PFS, or ORR. Predictive biomarkers that identify patient groups who will most likely gain clinical benefit from onartuzumab require further investigation. The mTOR is known to be the mammalian target of rapamycin and is encoded by the mTOR gene in humans. Phosphatidylinositol 3-kinase (PI3K)/Akt and mTOR activated in 30%-60% of gastric cancer PI3K/Akt/mTOR pathway dysregulations are associated with chemotherapy resistance. Everolimus is an oral mTOR inhibitor and was established as standard therapy in several types of cancer. Although everolimus in a phase II trial was demonstrated to be significantly beneficial clinically, in a phase III trial, everolimus did not significantly improve OS for AGC after first- or second-line chemotherapy compared with BSC (GRANITE-1). The reason for these results was discussed to be partially attributable to the slightly higher percentage of placebo groups who initiated antineoplastic therapy after a study on drug discontinuation. In everolimus treatment, the predictive biomarker also needs to be investigated to determine its more effective use. The Claudin-18 splice variant 2 (CLDN18.2) belongs to a family of tight junction proteins. Claudin 18.2 is expressed in several types of cancer including GC. Claudiximab (IMAB362) is the chimeric monoclonal anti-CLDN18.2 antibody which activates antibody and component dependent cytotoxicity. In the FAST study, combinations of claudiximab with first line chemotherapy was evaluated in patients with advanced or recurrent GC or GEJA (NCT01630083). Claudiximab in combination with EOX (epirubicin + oxaliplatin + capecitabine) as first line have been showed clinically benefit in PFS and OS in this study. Therefore, it will be expected to establish the evidence from a phase III trial in future. Matrix metalloproteinase (MMPs) is a matrixin, a class of enzymes that belong to the zinc metalloproteinases family. MMP-9 is an extracellular enzyme which progress angiogenesis, tumor proliferation, and metastasis. GS-5745 is a monoclonal antibody that inhibits MMP-9 and has been combined with other chemotherapies. Andecaliximab (GS-5745) is now being examined in a phase III trial in GC with mFOLFOX as 1st line (NCT02545504). Cancer immunotherapy is the use of the immune system in humans themselves to treat cancer. Conventionally, active immunotherapy, adoptive immunotherapy or antibody therapy have been developed as anticancer treatment. Active immunotherapy, which has been used in an attempt to stimulate the host’s immune response to disease, such as a cancer vaccine, dendritic cell (DC) therapy, or cytokine therapy, was approved for some cancer types. Antibodies play a key role in adaptive immune response. Adoptive immunotherapy and antibody therapy use anti-tumor responses, monoclonal antibodies, lymphocytes and cytokines. However, the clinical effect of these therapies is limited and disparity exists for each evidence level for cancer treatment. Most recently, immunotherapy has been acknowledged to be one of the most advanced therapies available in the treatment of cancer. We can experience the paradigmatic shift in the treatment of cancer including melanoma, NSCLC, renal cell carcinoma, and gastrointestinal cancer. Many clinical trials have been performed and have demonstrated clinical benefits in several types of cancer. Furthermore, the common advantages of immunotherapy compared with other chemotherapies have been reported to be safe and applicable to a large number of patients. In GC, many clinical trials or research studies have been promoted with promising evidence presented [Table 2]. This section will describe immune checkpoint inhibiters [Figure 2], peptide based inhibitors, and other immunotherapies in GC. Cancer vaccines have been developed as therapeutic vaccines that activate tumor-associated antigen-specific T cells and reactivate existing tumor-specific T cells that are in a dormant or anergic state. This therapeutic mechanism depends on stimulating dendritic cells (DC) and activating natural killer (NK) cells, B cells, and naïve and memory T cells. Although cancer vaccines are verified depending on whether or not it sees an improvement in the prognosis of patients with solid tumor, they have not been shown to contribute to prolonging OS in phase III trials. In recent years, in a phase I trial, vaccination with up-regulated lung cancer 10 and VEGFR epitope peptide was demonstrated to safely treat AGC. Furthermore, a clinical trial of combined cancer vaccine with immune checkpoint inhibitors is planned in several types of cancer. Therefore, results of this trial about cancer vaccine in the future are expected. Other immunotherapies are being verified as potential therapies. Lymphocyte activation gene3 (LAG3), member of the immunoglobulin superfamily that exerts a wide variety of biological impacts on T cell function, is another vital checkpoint that is expected to have a synergistic interaction with PD-1/PD-L1. The combining anti-LAG3 “relatlimab” with nivolumab in patients with solid tumors have been assessed in clinical trial (NCT01968109). Glucocorticoid-induced TNFR family-related protein (GITR) is expressed at high levels on regulatory T cells (Treg). The agonist GITR antibody was reported to inhibit Treg-mediated suppression by eliminating GITR-expressing tumor-infiltrating Treg, or by causing them to become unstable, thereby attenuating their suppressive activity. This anti-GITR-mAb (TRX518) is also examined in phase I trials to determine the safety of treatment in stage III or IV melanoma and other solid tumors including GC (NCT01239134). These trials are ongoing with reports detailing their results expected in the near future. Recently, TCR-inducible costimulatory receptor, marker of effector Treg, was a reportedly promising target for direct Treg-targeted therapeutic agents for GC. From the progress of these research activities, Treg is also considered to be an attractive target of treatment for patients with AGC. Polysaccharide-k (PSK) is a protein-bound polysaccharide isolated from Trametes versicolor. In the past, addition of PSK to chemotherapy was evaluated to be efficient and its use was attempted in GC treatment after curative gastrectomy as adjuvant treatment. However, PSK’s clinical benefit was determined to be limited; therefore, few studies have included its use in recent years. Nivolumab is a human IgG4 monoclonal antibody that acts against PD-1 and has been approved for monotherapy and combination therapy for metastatic melanoma, NSCLC, renal cell carcinoma. Nivolumab works as a checkpoint inhibitor blocking signal that prevents activated T cells from attacking cancer. In a phase I/II trial, patients with nivolumab monotherapy received two or more prior regimens (CheckMate-032). The ORR was 14%, median PFS was 1.4 months, MST was 5.0 months and disease control rate was 32%. The 6-month survival rate was 49% and the 12-month survival rate was 36%. A phase III trial demonstrated that nivolumab significantly prolonged OS in patients with AGC or GEJA who had failed two or more standard chemotherapies (ONO-4538-12, ATTRACTION-2). In this trial, MST was 5.32 months with nivolumab vs. 4.14 months with placebo, and 12 months OS in the nivolumab group was 26.6% vs. 10.9% in the placebo group. Therefore, these results strongly support establishing treatment with nivolumab as a standard therapy for patients with GC. In practice, nivolumab was approved and started for treating AGC as a third-line treatment or after treatment. In addition, in a phase III trial, nivolumab was added to cytotoxic chemotherapy as first-line chemotherapy and evaluated (CheckMate649). This trial is expected to present new clinical benefits in the near future. Pembrolizumab is a selective, humanized, high-affinity IgG4κ monoclonal antibody designed to bind to PD-1 and block interactions between PD-1 and its ligands. In patients with recurrent or metastatic PD-L1-positive GC enrolled in a phase Ib trial, pembrolizumab reportedly had a manageable toxicity profile and effective antitumor activity (KEYNOTE-012). In particular, 22% of patients with pembrolizumab had an overall response and 13% patients had grade3 or 4 treatment-related adverse events. In addition, that trial suggested a possible association between PD-L1 expression levels and pembrolizumab activity in GC. In a phase II trial, as a first-line treatment for AGC or GEJA, pembrolizumab as a monotherapy has been combined with cisplatin + 5-fluorouracil or capecitabine in subjects, with examinations ongoing (KEYNOTE-059, NCT02335411). Furthermore, in two ongoing phase III trials, pembrolizumabis compared with paclitaxel as second-line treatment for AGC or GEJA (KEYNOTE-061, NCT02370498), and pembrolizumab monotherapy is compared with a combination therapy of 5-FU (or capecitabine) plus cisplatin plus pembrolizumab or placebo as first-line treatment for patients who are PD-L1 positive and HER2 negative (KEYNOTE-062, NCT02494583). Ipilimumab is a human IgG1 monoclonal antibody that acts against cytotoxic T-lymphocyte antigen 4 (CTLA-4)/B7 interaction to restore CD4 and CD8 effector activation. In a phase II trial, ipilimumab was compared with BSC for patients who had received first-line chemotherapy that was not significantly superior in efficiency as maintenance therapy. Comparing the efficiency of nivolumab as a single agent or in combination with ipilimumab was performed in phase I/II trial (checkmate-032). The nivolumab + ipilimumab group showed a relatively higher ORR than the nivolumab monotherapy group (14% with nivolumab monotherapy and 26% with nivolumab + ipilimumab). A phase III trial of nivolumab + ipilimumab in patients with AGC is ongoing (NCT02872116). Avelumab is an intravenously administered PD-L1 blocking human IgG1 lambda antibody for the treatment of various tumors. Avelumab has now been approved by the Food and Drug Administration (FDA) for the treatment of Merkel-cell carcinoma. In GC, the focus of a phase III study, avelumab is compared with best supportive care after response or stability to oxaliplatin and fluoropyrimidine, with examination ongoing (JAVELIN Gastric 100, NCT2625610). Avelumab is also now being verified to compare avelumab and BSC vs. paclitaxel or irinotecan and BSC in third-line treatment of AGC (JAVELIN Gastric 300, NCT02625623). Durvalumab (MEDI4736) is a human IgG1κ monoclonal antibody that blocks the interaction of PD-L1 with PD-1 and CD80 molecules. This antibody has been approved for the treatment of patients with locally advanced or metastatic urothelial carcinoma. Durvalumab has also been shown to be efficient in GC. 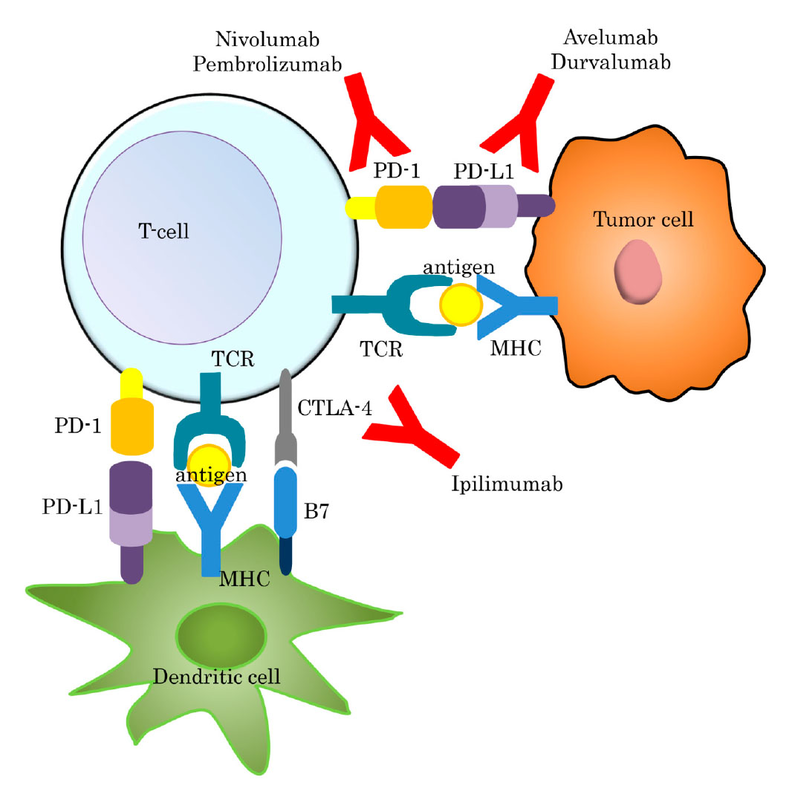 Therefore, evaluating the safety, tolerability, antitumor activity, PK, pharmacodynamics and immunogenicity of durvalumab in combination with tremelimumab, which is a human IgG2 fully monoclonal antibody that acts against CTLA-4, and examining tremelimumab monotherapy in subjects with metastatic or recurrent GC or GEJA are ongoing in a phase Ib/II trial. Durvalumab has also been evaluated for efficiency with another medicine, epacadostat (INCB024360) (ECHO-203, NCT02318277). Epacadostat is a potent and novel indolemine-2, 3 dioxygenase (IDO1) inhibitor. IDO1 is an enzyme responsible for oxidizing tryptophan into kynurenine and is implicated in immune modulation through its ability to limit T cell function and engage mechanisms of immune tolerance. IDO1 is focused upon as an immune subversion strategy and therapies targeting IDO1 are being evaluated in many types of cancer including GC. Although several clinical trials have attempted to improve prognosis in GC patients and their survival rate has been improving in recent years, unresectable or metastatic AGC has been untreatable, and median survival at this stage remains poor. Therefore, research into more effective therapeutic targets, biological mechanisms, and treatments for AGC is essential. Research that targeted therapy, including target genes, signaling pathways and drugs, is being developed day by day. Over the past few years, trastuzumab, as a first-line treatment for AGC and ramucirumab, as a second-line treatment has been recommended worldwide. Although many clinical trials have failed and have been unable to contribute new clinical benefits, further research has been conducted into establishing the next standard treatment for GC. In the present article, we summarized recent clinical trials. At this time, many useful basic research and preclinical trials are being performed and their progress is expected to provide us with better treatment for patients with GC in the near future. In the field of immunotherapy, especially, more innovative treatments and combinations with other therapies are expected to be established. In addition to the clinical trials listed in this article, various other clinical trials and preclinical research are conducted in several types of cancer. Immunotherapeutic approaches with other agents, chemotherapies, targeting therapies, radiations, or different kinds of immunotherapies are currently being investigated to determine whether each clinical outcome is improved or not. In combined immunotherapy and cytotoxic chemotherapy, the synergism of these combinations is expected to lead to immunogenic cell death (ICD). ICD is a form of cell death induced by cytotoxic agents such as oxaliplatin. As another mechanism, gemcitabine or docetaxel reportedly inhibits the increasing myeloid-derived suppressor cells and B cell. Based on those mechanisms, a trial combination comparing nivolumab and conventional chemotherapy and other clinical trials is ongoing. In phase I or I/II trials, combinations of targeting therapies and immunotherapies, such as atezolizumab, which is a PD-L1 inhibitor, and bevacizumab, are examined in participants with solid tumors including GC (NCT02715531). In other types of cancer, the safety and tolerability of these therapies have been confirmed. If such trials demonstrate clinical benefit in GC, we can expect an increase of various combination patterns of therapies that have different anticancer mechanisms. Simultaneously, a start on evaluating adverse events and long-time clinical benefits should be made as soon as possible. This is particularly necessary considering that a diverse range of adverse events in immunotherapy have already been reported in many trials including GC themes; furthermore, whether or not exacerbation factors exist in some combination therapies must be confirmed. In preclinical research, the combination of multiple immune checkpoint therapy has been verified in mice. In light of this knowledge, more innovative treatment for GC is expected to be developed. In another respect, combinations of multiple drug regimens that have been approved for other types of cancer are expected for adaptation expansion to GC. For example, in melanoma, the FDA has already approved many drugs and combinations, such as ipilimumab alone, combined nivolumab and ipilimumab, pembrolizumab alone, the oncolytic virus therapy talimogene laherparepvec “T-VEC”, or other immunotherapies, targeting therapies, or chemotherapies. Investigation into whether or not these drugs with or without some combinations improve GC prognosis is the next possible step. Although molecular targeted therapy and immunotherapy have been already accepted based on phase III trials, many clinical trials have resulted in negative results. Some possible specific problems in GC exist. First, GCs have heterogeneous characteristics with diverse histological types and genotypes. A previous study revealed associations between histological subtypes and germline mutations. Furthermore, infection with Helicobacter pylori (H. pylori) and Epstein-Barr virus (EBV) has been shown to promote carcinogenesis in GC. The frequencies and association with H. pylori, EBV and GC or cancer control including prevention of these infections differed in each country and the conditions of these infections might affect the results of clinical trials. Based on this knowledge, development of a global consensus for gastritis with these infections has begun. In recent years, The Cancer Genome Atlas (TCGA) analyzed many DNA alternations of GC and proposed four GC subtypes: EBV-infected tumors, microsatellite instability (MSI) tumors, genomically stable tumors, and chromosomally unstable tumors, at the molecular levels. In addition, EBV-infected tumors are associated with high PD-L1 expression, and high MSI tumors are associated with high response rates to immunotherapies in other types of solid tumors[51,52]. Especially, MSI tumors have been reported to be possibly associated with sensitivity toward immune checkpoint blockade, regardless of the cancer tissue’s origin. Therefore, GC subtypes or tumor mutation must also be evaluated as a predictor of response to targeted therapy and immunotherapies. Second, no established biomarkers exist to select optimum patient groups in GC treatment. Accordingly, discovery of useful biomarkers in GC treatment in previous clinical trials has not been reached. As aforementioned, in CRC, significant clinical benefits have been gained from selecting treatment methods based on genetic mutation as a predictive biomarker of response to targeted therapy, such as KRAS mutation. Therefore, identifying reliable biomarkers to accurately select patients would lead to selection of best treatment for each personalized tumor, implementating personalized medicine. To overcome such problems, new technology such as miRNA, lncRNA which considered potential biomarker or to regulate GC progression at the transcript or transcript level has also been developed. Although these researches are still in the preclinical stage, they have been expected as a solution for the recent problems. In future, development of multidisciplinary treatment, including targeted therapy and immunotherapy, is expected to contribute to performing individualized therapy depending on the characteristics of the GC. Revealing each patient’s genomic, biological, and immunological condition will contribute to selecting the most curate treatment. However, these approaches are unable to overcome our big health problem, GC. 1. Stomach Cancer: Estimated Incidence, Mortality and Prevalence Worldwide in 2012. Available from: http://globocan.iarc.fr/old/FactSheets/cancers/stomach-new.asp [Last accessed on 26 Jun 2018]. 2. Koizumi W, Narahara H, Hara T, Takagane A, Akiya T, Takagi M, Miyashita K, Nishizaki T, Kobayashi O, Takiyama W, Toh Y, Nagaie T, Takagi S, Yamamura Y, Yanaoka K, Orita H, Takeuchi M. S-1 plus cisplatin versus S-1 alone for first-line treatment of advanced gastric cancer (SPIRITS trial): a phase III trial. Lancet Oncol 2008;9:215-21. 3. Kang YK, Kang WK, Shin DB, Chen J, Xiong J, Wang J, Lichinitser M, Guan Z, Khasanov R, Zheng L, Philco-Salas M, Suarez T, Santamaria J, Forster G, McCloud PI. Capecitabine/cisplatin versus 5-fluorouracil/cisplatin as first-line therapy in patients with advanced gastric cancer: a randomised phase III noninferiority trial. Ann Oncol 2009;20:666-73. 4. Bang YJ, Van Cutsem E, Feyereislova A, Chung HC, Shen L, Sawaki A, Lordick F, Ohtsu A, Omuro Y, Satoh T, Aprile G, Kulikov E, Hill J, Lehle M, Ruschoff J, Kang YK; ToGA Trial Investigators. Trastuzumab in combination with chemotherapy versus chemotherapy alone for treatment of HER2-positive advanced gastric or gastro-oesophageal junction cancer (ToGA): a phase 3, open-label, randomised controlled trial. Lancet 2010;376:687-97. 5. Fuchs CS, Tomasek J, Yong CJ, Dumitru F, Passalacqua R, Goswami C, Safran H, Dos Santos LV, Aprile G, Ferry DR, Melichar B, Tehfe M, Topuzov E, Zalcberg JR, Chau I, Campbell W, Sivanandan C, Pikiel J, Koshiji M, Hsu Y, Liepa AM, Gao L, Schwartz JD, Tabernero J; REGARD Trial Investigators. Ramucirumab monotherapy for previously treated advanced gastric or gastro-oesophageal junction adenocarcinoma (REGARD): an international, randomised, multicentre, placebo-controlled, phase 3 trial. Lancet 2014;383:31-9. 6. Wilke H, Muro K, Van Cutsem E, Oh SC, Bodoky G, Shimada Y, Hironaka S, Sugimoto N, Lipatov O, Kim TY, Cunningham D, Rougier P, Komatsu Y, Ajani J, Emig M, Carlesi R, Ferry D, Chandrawansa K, Schwartz JD, Ohtsu A; RAINBOW Study Group. Ramucirumab plus paclitaxel versus placebo plus paclitaxel in patients with previously treated advanced gastric or gastro-oesophageal junction adenocarcinoma (RAINBOW): a double-blind, randomised phase 3 trial. Lancet Oncol 2014;15:1224-35. 7. Kang YK, Boku N, Satoh T, Ryu MH, Chao Y, Kato K, Chung HC, Chen JS, Muro K, Kang WK, Yeh KH, Yoshikawa T, Oh SC, Bai LY, Tamura T, Lee KW, Hamamoto Y, Kim JG, Chin K, Oh DY, Minashi K, Cho JY, Tsuda M, Chen LT. Nivolumab in patients with advanced gastric or gastro-oesophageal junction cancer refractory to, or intolerant of, at least two previous chemotherapy regimens (ONO-4538-12, ATTRACTION-2): a randomised, double-blind, placebo-controlled, phase 3 trial. Lancet 2017;390:2461-71. 8. Thuss-Patience PC, Shah MA, Ohtsu A, Van Cutsem E, Ajani JA, Castro H, Mansoor W, Chung HC, Bodoky G, Shitara K, Phillips GDL, van der Horst T, Harle-Yge ML, Althaus BL, Kang YK. Trastuzumab emtansine versus taxane use for previously treated HER2-positive locally advanced or metastatic gastric or gastro-oesophageal junction adenocarcinoma (GATSBY): an international randomised, open-label, adaptive, phase 2/3 study. Lancet Oncol 2017;18:640-53. 9. Hecht JR, Bang YJ, Qin SK, Chung HC, Xu JM, Park JO, Jeziorski K, Shparyk Y, Hoff PM, Sobrero A, Salman P, Li J, Protsenko SA, Wainberg ZA, Buyse M, Afenjar K, Houe V, Garcia A, Kaneko T, Huang Y, Khan-Wasti S, Santillana S, Press MF, Slamon D. Lapatinib in combination with capecitabine plus oxaliplatin in human epidermal growth factor receptor 2-positive advanced or metastatic gastric, esophageal, or gastroesophageal adenocarcinoma: TRIO-013/LOGiC--a randomized phase III trial. J Clin Oncol 2016;34:443-51. 10. Satoh T, Xu RH, Chung HC, Sun GP, Doi T, Xu JM, Tsuji A, Omuro Y, Li J, Wang JW, Miwa H, Qin SK, Chung IJ, Yeh KH, Feng JF, Mukaiyama A, Kobayashi M, Ohtsu A, Bang YJ. Lapatinib plus paclitaxel versus paclitaxel alone in the second-line treatment of HER2-amplified advanced gastric cancer in Asian populations: TyTAN--a randomized, phase III study. J Clin Oncol 2014;32:2039-49. 11. Carpenter G, Cohen S. Epidermal growth factor. J Biol Chem 1990;265:7709-12. 12. Li S, Schmitz KR, Jeffrey PD, Wiltzius JJ, Kussie P, Ferguson KM. Structural basis for inhibition of the epidermal growth factor receptor by cetuximab. Cancer Cell 2005;7:301-11. 13. Zhang W, Gordon M, Schultheis AM, Yang DY, Nagashima F, Azuma M, Chang HM, Borucka E, Lurje G, Sherrod AE, Iqbal S, Groshen S, Lenz HJ. FCGR2A and FCGR3A polymorphisms associated with clinical outcome of epidermal growth factor receptor expressing metastatic colorectal cancer patients treated with single-agent cetuximab. J Clin Oncol 2007;25:3712-8. 14. Bokemeyer C, Bondarenko I, Hartmann JT, de Braud F, Schuch G, Zubel A, Celik I, Schlichting M, Koralewski P. Efficacy according to biomarker status of cetuximab plus FOLFOX-4 as first-line treatment for metastatic colorectal cancer: the OPUS study. Ann Oncol 2011;22:1535-46. 15. Van Cutsem E, Kohne CH, Lang I, Folprecht G, Nowacki MP, Cascinu S, Shchepotin I, Maurel J, Cunningham D, Tejpar S, Schlichting M, Zubel A, Celik I, Rougier P, Ciardiello F. Cetuximab plus irinotecan, fluorouracil, and leucovorin as first-line treatment for metastatic colorectal cancer: updated analysis of overall survival according to tumor KRAS and BRAF mutation status. J Clin Oncol 2011;29:2011-9. 16. Lordick F, Kang YK, Chung HC, Salman P, Oh SC, Bodoky G, Kurteva G, Volovat C, Moiseyenko VM, Gorbunova V, Park JO, Sawaki A, Celik I, Gotte H, Melezinkova H, Moehler M, Arbeitsgemeinschaft Internistische O, Investigators E. Capecitabine and cisplatin with or without cetuximab for patients with previously untreated advanced gastric cancer (EXPAND): a randomised, open-label phase 3 trial. Lancet Oncol 2013;14:490-9. 17. Keating GM. 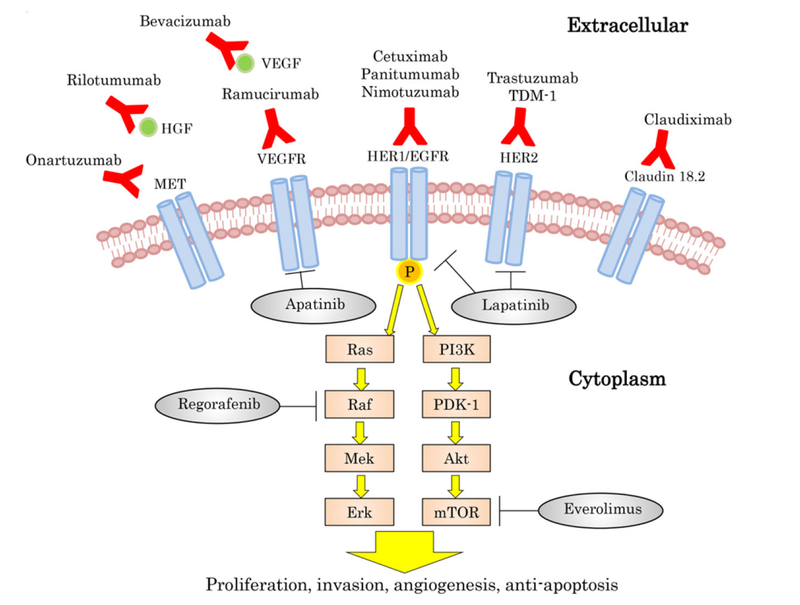 Panitumumab: a review of its use in metastatic colorectal cancer. Drugs 2010;70:1059-78. 18. Waddell T, Chau I, Cunningham D, Gonzalez D, Okines AF, Okines C, Wotherspoon A, Saffery C, Middleton G, Wadsley J, Ferry D, Mansoor W, Crosby T, Coxon F, Smith D, Waters J, Iveson T, Falk S, Slater S, Peckitt C, Barbachano Y. Epirubicin, oxaliplatin, and capecitabine with or without panitumumab for patients with previously untreated advanced oesophagogastric cancer (REAL3): a randomised, open-label phase 3 trial. Lancet Oncol 2013;14:481-9. 19. Talavera A, Friemann R, Gomez-Puerta S, Martinez-Fleites C, Garrido G, Rabasa A, Lopez-Requena A, Pupo A, Johansen RF, Sanchez O, Krengel U, Moreno E. Nimotuzumab, an antitumor antibody that targets the epidermal growth factor receptor, blocks ligand binding while permitting the active receptor conformation. Cancer Res 2009;69:5851-9. 20. Garrett TP, McKern NM, Lou M, Elleman TC, Adams TE, Lovrecz GO, Zhu HJ, Walker F, Frenkel MJ, Hoyne PA, Jorissen RN, Nice EC, Burgess AW, Ward CW. Crystal structure of a truncated epidermal growth factor receptor extracellular domain bound to transforming growth factor alpha. Cell 2002;110:763-73. 21. Satoh T, Lee KH, Rha SY, Sasaki Y, Park SH, Komatsu Y, Yasui H, Kim TY, Yamaguchi K, Fuse N, Yamada Y, Ura T, Kim SY, Munakata M, Saitoh S, Nishio K, Morita S, Yamamoto E, Zhang Q, Kim JM, Kim YH, Sakata Y. Randomized phase II trial of nimotuzumab plus irinotecan versus irinotecan alone as second-line therapy for patients with advanced gastric cancer. Gastric Cancer 2015;18:824-32. 22. Park DJ, Thomas NJ, Yoon C, Yoon SS. Vascular endothelial growth factor a inhibition in gastric cancer. Gastric Cancer 2015;18:33-42. 23. Shih T, Lindley C. Bevacizumab: an angiogenesis inhibitor for the treatment of solid malignancies. Clin Ther 2006;28:1779-802. 24. Ohtsu A, Shah MA, Van Cutsem E, Rha SY, Sawaki A, Park SR, Lim HY, Yamada Y, Wu J, Langer B, Starnawski M, Kang YK. Bevacizumab in combination with chemotherapy as first-line therapy in advanced gastric cancer: a randomized, double-blind, placebo-controlled phase III study. J Clin Oncol 2011;29:3968-76. 25. Li J, Qin S, Xu J, Xiong J, Wu C, Bai Y, Liu W, Tong J, Liu Y, Xu R, Wang Z, Wang Q, Ouyang X, Yang Y, Ba Y, Liang J, Lin X, Luo D, Zheng R, Wang X, Sun G, Wang L, Zheng L, Guo H, Wu J, Xu N, Yang J, Zhang H, Cheng Y, Wang N, Chen L, Fan Z, Sun P, Yu H. Randomized, double-blind, placebo-controlled phase III trial of apatinib in patients with chemotherapy-refractory advanced or metastatic adenocarcinoma of the stomach or gastroesophageal junction. J Clin Oncol 2016;34:1448-54. 26. Pavlakis N, Sjoquist KM, Martin AJ, Tsobanis E, Yip S, Kang YK, Bang YJ, Alcindor T, O'Callaghan CJ, Burnell MJ, Tebbutt NC, Rha SY, Lee J, Cho JY, Lipton LR, Wong M, Strickland A, Kim JW, Zalcberg JR, Simes J, Goldstein D. Regorafenib for the treatment of advanced gastric cancer (INTEGRATE): a multinational placebo-controlled phase II trial. J Clin Oncol 2016;34:2728-35. 27. Lordick F. Targeting the HGF/MET pathway in gastric cancer. Lancet Oncol 2014;15:914-6. 28. Cunningham D, Al-Batran SE, Davidenko I, Ilson DH, Murad AM, Tebbutt NC, Jiang Y, Loh E, Dubey S. RILOMET-1: An international phase III multicenter, randomized, double-blind, placebo-controlled trial of rilotumumab plus epirubicin, cisplatin, and capecitabine (ECX) as first-line therapy in patients with advanced MET-positive gastric or gastroesophageal junction (G/GEJ) adenocarcinoma. J Clin Oncol 2013;31 suppl 15:TPS4153. 29. Doi T, Kang YK, Muro K, Jiang Y, Jain RK, Lizambri R. A phase 3, multicenter, randomized, double-blind, placebo-controlled study of rilotumumab in combination with cisplatin and capecitabine (CX) as first-line therapy for Asian patients (pts) with advanced MET-positive gastric or gastroesophageal junction (G/GEJ) adenocarcinoma: the RILOMET-2 trial. J Clin Oncol 2015;33 suppl 3:TPS226. 30. Shah MA, Bang YJ, Lordick F, Alsina M, Chen M, Hack SP, Bruey JM, Smith D, McCaffery I, Shames DS, Phan S, Cunningham D. Effect of fluorouracil, leucovorin, and oxaliplatin with or without onartuzumab in HER2-negative, MET-positive gastroesophageal adenocarcinoma: the MET gastric randomized clinical trial. JAMA Oncol 2017;3:620-7. 31. Oki E, Baba H, Tokunaga E, Nakamura T, Ueda N, Futatsugi M, Mashino K, Yamamoto M, Ikebe M, Kakeji Y, Maehara Y. Akt phosphorylation associates with LOH of PTEN and leads to chemoresistance for gastric cancer. Int J Cancer 2005;117:376-80. 32. Doi T, Muro K, Boku N, Yamada Y, Nishina T, Takiuchi H, Komatsu Y, Hamamoto Y, Ohno N, Fujita Y, Robson M, Ohtsu A. Multicenter phase II study of everolimus in patients with previously treated metastatic gastric cancer. J Clin Oncol 2010;28:1904-10. 33. Ohtsu A, Ajani JA, Bai YX, Bang YJ, Chung HC, Pan HM, Sahmoud T, Shen L, Yeh KH, Chin K, Muro K, Kim YH, Ferry D, Tebbutt NC, Al-Batran SE, Smith H, Costantini C, Rizvi S, Lebwohl D, Van Cutsem E. Everolimus for previously treated advanced gastric cancer: results of the randomized, double-blind, phase III GRANITE-1 study. J Clin Oncol 2013;31:3935-43. 34. Lordick F, Schuler M, Al-Batran SE, Zvirbule Z, Manikhas G, Rusyn A, Vinnyk Y, Vynnychenko I, Fadeeva N, Nechaeva M, Dudov A, Gotovkin E, Pecheniy A, Bazin I, Bondarenko I, Melichar B, Huber C, Sahin U, Türeci Ö. 220O Claudin 18.2 - a novel treatment target in the multicenter, randomized, phase II FAST study, a trial of epirubicin, oxaliplatin, and capecitabine (EOX) with or without the anti-CLDN18.2 antibody IMAB362 as 1st line therapy in advanced gastric and gastroesophageal junction (GEJ) cancer. Ann Oncol 2016;27 suppl 9:mdw582.001. 35. Shah MA, Starodub A, Wainberg ZA, Wu M, Smith V, Maltzman JD, Bendell JC. Results of a phase I study of GS-5745 in combination with mFOLFOX in patients with advanced unresectable gastric / GE junction tumors. J Clin Oncol 2016;34 suppl 15:4033. 36. Hodi FS, O'Day SJ, McDermott DF, Weber RW, Sosman JA, Haanen JB, Gonzalez R, Robert C, Schadendorf D, Hassel JC, Akerley W, van den Eertwegh AJ, Lutzky J, Lorigan P, Vaubel JM, Linette GP, Hogg D, Ottensmeier CH, Lebbe C, Peschel C, Quirt I, Clark JI, Wolchok JD, Weber JS, Tian J, Yellin MJ, Nichol GM, Hoos A, Urba WJ. Improved survival with ipilimumab in patients with metastatic melanoma. N Engl J Med 2010;363:711-23. 37. Higashihara Y, Kato J, Nagahara A, Izumi K, Konishi M, Kodani T, Serizawa N, Osada T, Watanabe S. Phase I clinical trial of peptide vaccination with URLC10 and VEGFR1 epitope peptides in patients with advanced gastric cancer. Int J Oncol 2014;44:662-8. 38. Sukumar S, Wilson DC, Yu Y, Wong J, Naravula S, Ermakov G, Riener R, Bhagwat B, Necheva AS, Grein J, Churakova T, Mangadu R, Georgiev P, Manfra D, Pinheiro EM, Sriram V, Bailey WJ, Herzyk D, McClanahan TK, Willingham A, Beebe AM, Sadekova S. Characterization of MK-4166, a clinical agonistic antibody that targets human GITR and inhibits the generation and suppressive effects of T regulatory cells. Cancer Res 2017;77:4378-88. 39. Nagase H, Takeoka T, Urakawa S, Morimoto-Okazawa A, Kawashima A, Iwahori K, Takiguchi S, Nishikawa H, Sato E, Sakaguchi S, Mori M, Doki Y, Wada H. ICOS+ Foxp3+ TILs in gastric cancer are prognostic markers and effector regulatory T cells associated with Helicobacter pylori. Int J Cancer 2017;140:686-95. 40. Ueda Y, Fujimura T, Kinami S, Hirono Y, Yamaguchi A, Naitoh H, Tani T, Kaji M, Yamagishi H, Miwa K; Hokuriku-Kinki Immunochemo-Therapy Study Group-Gastric Cancer (HKIT-GC). A randomized phase III trial of postoperative adjuvant therapy with S-1 alone versus S-1 plus PSK for stage II/IIIA gastric cancer: Hokuriku-Kinki Immunochemo-Therapy Study Group-Gastric Cancer (HKIT-GC). Jpn J Clin Oncol 2006;36:519-22. 41. Janjigian YY, Bendell JC, Calvo E, Kim JW, Ascierto PA, Sharma P, Ott PA, Bono P, Jaeger D, Evans TRJ, Braud FGD, Chau I, Tschaika M, Harbison CT, Lin CS, Le DT. CheckMate-032: Phase I/II, open-label study of safety and activity of nivolumab (nivo) alone or with ipilimumab (ipi) in advanced and metastatic (A/M) gastric cancer (GC). J Clin Oncol 2016;34 suppl 15:4010. 42. Muro K, Chung HC, Shankaran V, Geva R, Catenacci D, Gupta S, Eder JP, Golan T, Le DT, Burtness B, McRee AJ, Lin CC, Pathiraja K, Lunceford J, Emancipator K, Juco J, Koshiji M, Bang YJ. Pembrolizumab for patients with PD-L1-positive advanced gastric cancer (KEYNOTE-012): a multicentre, open-label, phase 1b trial. Lancet Oncol 2016;17:717-26. 43. Bang YJ, Cho JY, Kim YH, Kim JW, Di Bartolomeo M, Ajani JA, Yamaguchi K, Balogh A, Sanchez T, Moehler M. Efficacy of sequential ipilimumab monotherapy versus best supportive care for unresectable locally advanced/metastatic gastric or gastroesophageal junction cancer. Clin Cancer Res 2017;23:5671-8. 44. Janjigian YY, Ott PA, Calvo E, Kim JW, Ascierto PA, Sharma P, Peltola KJ, Jaeger D, Evans TRJ, Braud FGD, Chau I, Tschaika M, Harbison CT, Cai W, Bendell JC, Le DT. Nivolumab ± ipilimumab in pts with advanced (adv)/metastatic chemotherapy-refractory (CTx-R) gastric (G), esophageal (E), or gastroesophageal junction (GEJ) cancer: CheckMate 032 study. J Clin Oncol 2017;35 suppl 15:4014. 45. Yue EW, Sparks R, Polam P, Modi D, Douty B, Wayland B, Glass B, Takvorian A, Glenn J, Zhu W, Bower M, Liu X, Leffet L, Wang Q, Bowman KJ, Hansbury MJ, Wei M, Li Y, Wynn R, Burn TC, Koblish HK, Fridman JS, Emm T, Scherle PA, Metcalf B, Combs AP. INCB24360 (Epacadostat), a highly potent and selective indoleamine-2,3-dioxygenase 1 (IDO1) inhibitor for immuno-oncology. ACS Med Chem Lett 2017;8:486-91. 46. Kodera Y. Neoadjuvant chemotherapy for gastric adenocarcinoma in Japan. Surg Today 2017;47:899-907. 47. Ajani JA, Lee J, Sano T, Janjigian YY, Fan D, Song S. Gastric adenocarcinoma. Nat Rev Dis Primers 2017;3:17036. 48. Galluzzi L, Buque A, Kepp O, Zitvogel L, Kroemer G. Immunological effects of conventional chemotherapy and targeted anticancer agents. Cancer Cell 2015;28:690-714. 49. Wong SS, Kim KM, Ting JC, Yu K, Fu J, Liu S, Cristescu R, Nebozhyn M, Gong L, Yue YG, Wang J, Ronghua C, Loboda A, Hardwick J, Liu X, Dai H, Jin JG, Ye XS, Kang SY, Do IG, Park JO, Sohn TS, Reinhard C, Lee J, Kim S, Aggarwal A. Genomic landscape and genetic heterogeneity in gastric adenocarcinoma revealed by whole-genome sequencing. Nat Commun 2014;5:5477. 50. Sugano K, Tack J, Kuipers EJ, Graham DY, El-Omar EM, Miura S, Haruma K, Asaka M, Uemura N, Malfertheiner P, faculty members of Kyoto Global Consensus Conference. Kyoto global consensus report on Helicobacter pylori gastritis. Gut 2015;64:1353-67. 51. Cancer Genome Atlas Research Network. Comprehensive molecular characterization of gastric adenocarcinoma. Nature 2014;513:202-9. 52. Le DT, Uram JN, Wang H, Bartlett BR, Kemberling H, Eyring AD, Skora AD, Luber BS, Azad NS, Laheru D, Biedrzycki B, Donehower RC, Zaheer A, Fisher GA, Crocenzi TS, Lee JJ, Duffy SM, Goldberg RM, de la Chapelle A, Koshiji M, Bhaijee F, Huebner T, Hruban RH, Wood LD, Cuka N, Pardoll DM, Papadopoulos N, Kinzler KW, Zhou S, Cornish TC, Taube JM, Anders RA, Eshleman JR, Vogelstein B, Diaz LA, Jr. PD-1 blockade in tumors with mismatch-repair deficiency. N Engl J Med 2015;372:2509-20. 53. Le DT, Durham JN, Smith KN, Wang H, Bartlett BR, Aulakh LK, Lu S, Kemberling H, Wilt C, Luber BS, Wong F, Azad NS, Rucki AA, Laheru D, Donehower R, Zaheer A, Fisher GA, Crocenzi TS, Lee JJ, Greten TF, Duffy AG, Ciombor KK, Eyring AD, Lam BH, Joe A, Kang SP, Holdhoff M, Danilova L, Cope L, Meyer C, Zhou S, Goldberg RM, Armstrong DK, Bever KM, Fader AN, Taube J, Housseau F, Spetzler D, Xiao N, Pardoll DM, Papadopoulos N, Kinzler KW, Eshleman JR, Vogelstein B, Anders RA, Diaz LA, Jr. Mismatch repair deficiency predicts response of solid tumors to PD-1 blockade. Science 2017;357:409-13. 54. Hao NB, He YF, Li XQ, Wang K, Wang RL. The role of miRNA and lncRNA in gastric cancer. Oncotarget 2017;8:81572-82.